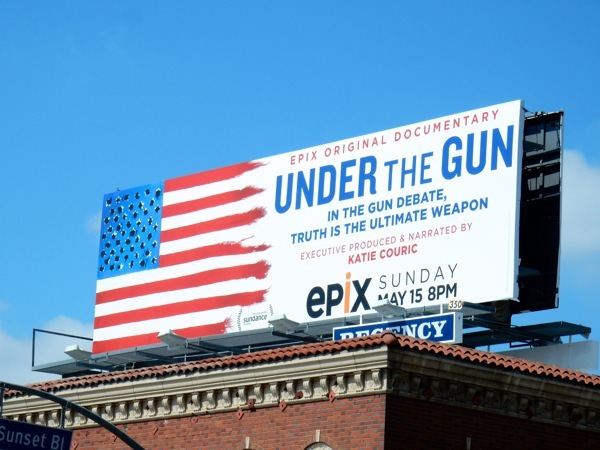 These days you can guarantee when you turn on the news there'll be a story about gun violence, whether it be a mass school shooting, random acts of carnage at a shopping mall or cinema, domestic terrorist attacks, or sadly children getting hold of parents firearms and shooting themselves, or killing someone else, or some other horrific example. 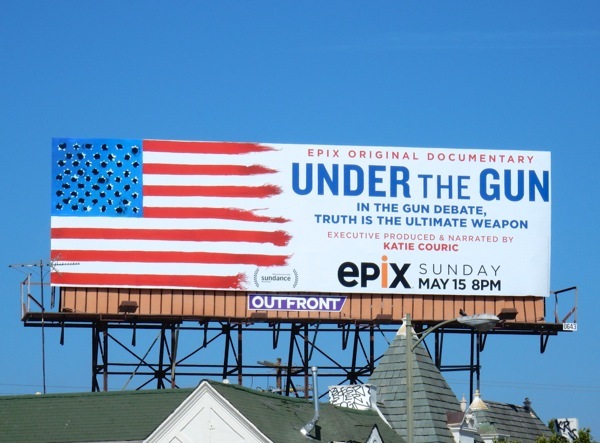 The gun ownership debate is an issue that continues to divide the United States, so this bullet hole-ridden American flag is the perfect ad creative for Epix's new documentary film, Under the Gun. 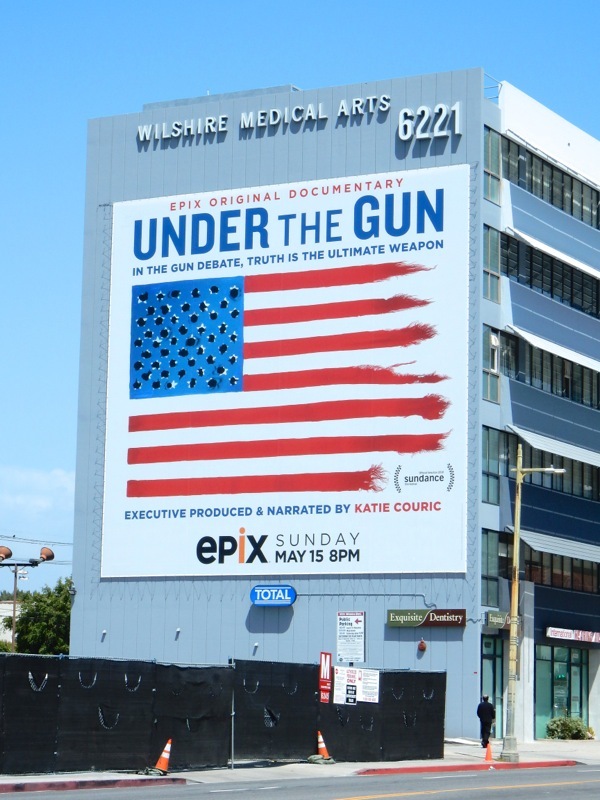 Obviously the film narrated by Katie Couric has nothing to do with Tim Gunn's Project Runway spin-off series Under the Gunn, but rather examines the drastic rise in mass shootings, like the one at Sandy Hook elementary school where 20 children were murdered by a gun obsessed shooter and despite the national outrage, highlights the stranglehold the National Rifle Association has on politics and the law makers in Washington, D.C. These striking Under the Gun Epix billboards were spotted along Sunset Boulevard, Wilshire Boulevard and Pico Boulevard from May 1 to May 4, 2016. 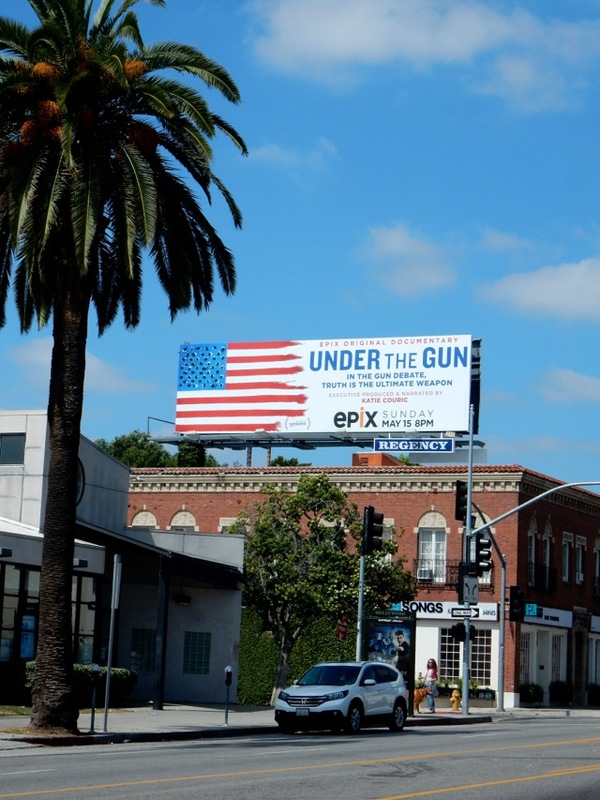 As a bonus here's also another billboard utilising the national flag, this one for the movie about the greed and over indulgence involved with the early 2000's housing market collapse, Americons, photographed along Sunset Boulevard in Hollywood on January 4, 2015. 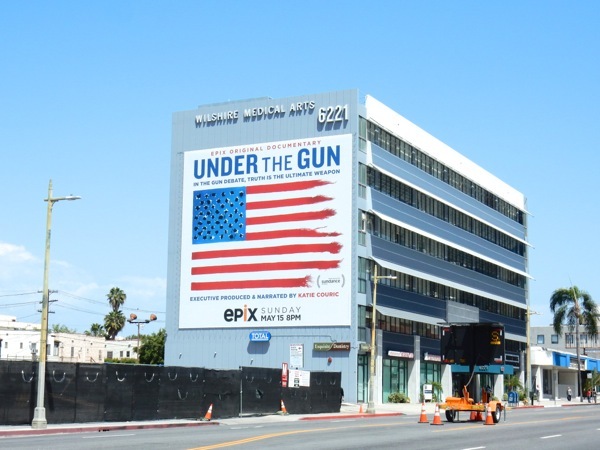 For an additional example of incorporating gun violence in the U.S. Stars and Stripes flag, make sure you also check out this movie billboard for The Purge: Anarchy (which scarily enough feels more and more like the world our society is devolving into). 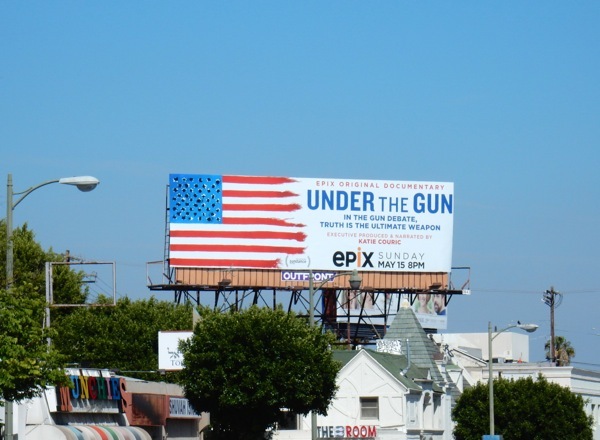 Obviously there's no simple solution to problems of gun violence, although one thing's for sure, more guns is not the answer. 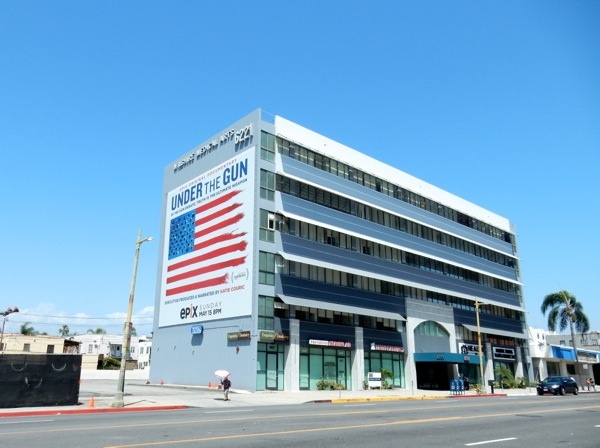 That's it for another FILM WEEK here at Daily Billboard, stay tuned in the days to come for a more eclectic mix of ad creatives from the worlds of TV, music and lifestyle brands.